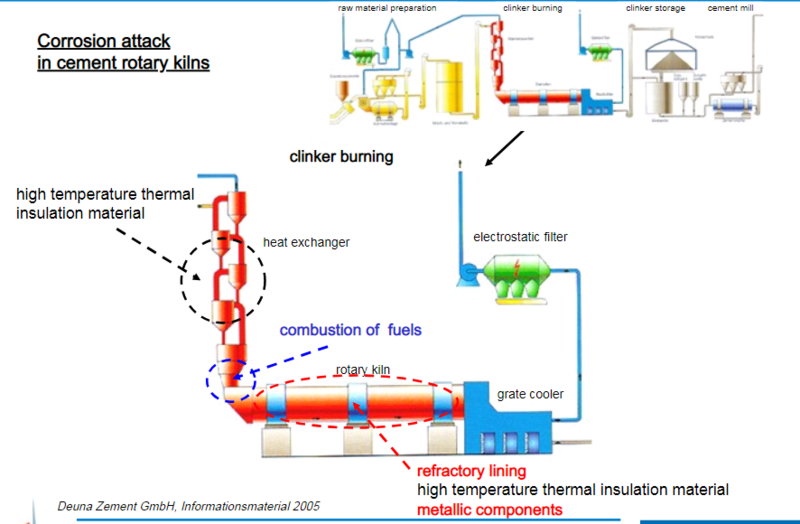 Cement Clinker Quality and Composition Combustion – oxidation and reduction. In the preceding session we talked about the need for a sharp temperature profile to achieve rapid heating to the combination temperature of the clinker. Also that the main burner must be inserted the minimum practical distance into the kiln to minimise the cooling zone in the kiln after the clinker has passed under the flame, the clinker is then rapidly cooled by falling into the cooler while still at a high temperature. In order to understand how to produce that sharp temperature profile we have to understand the dynamics of cement kiln burners and flames, even though this is not strictly “chemistry”. The design and adjustment of the burner produces the flame that can provide the sharp hot temperature profile required, along with the amount of excess air and oxygen drawn into the kiln. The cement kiln flame is generated by the combustion of hydrocarbon fuels, i.e. fuels that are composed principally of hydrogen and carbon combined in various hydrocarbon molecules. Oxidation of this hydrogen and carbon liberates the exothermic energy that produces the temperature for combination of the feed into the clinker minerals. These oxidation reactions can only take place when the hydrocarbons in the fuel are brought into contact with the oxygen in the combustion air by mixing of the combustion air and fuel. Once mixing is completed ignition and oxidation take place very rapidly, therefore, mixing is the rate determining process, provided that the combustion product gases are adequately exhausted from the flame. Exhausting of the combustion product gases is provided by the induced draft fan, which serves a dual purpose by also drawing the combustion air into the kiln. Mixing of the combustion air and fuel in a cement kiln flame relies on jet entrainment of the secondary combustion air into the flame. The burner blows a jet of primary air and fuel into the kiln. The process is momentum controlled and continues until the velocity of the jet is the same as the surrounding air. The excess momentum of the jet then pulls back exhaust gases from further up the kiln and entrains them into the flame. This phenomenon is known as “external recirculation” and is critical for characteristics of the flame. The primary air mixes with the fuel very quickly. The entrainment of the secondary air is then dependent on the ratio of the primary air/fuel jet and the momentum of the secondary air. The higher the flow rate and velocity of the primary air the quicker the mixing. Recirculation is an indication that all the secondary air has been entrained into the flame and fuel/air mixing is complete. A recirculating flame provides the short burning zone and sharp temperature profile required for optimum clinker quality and other non-quality related benefits. The recirculation prevents the flame expanding to impinge on the refractory. The recirculating gases provide a cushion of cooler exhaust gas that protects the refractory. With a recirculating flame oxidising burning conditions can be guaranteed with a small excess of air above that required for combustion, as little as 1~2% oxygen at the kiln inlet. Without recirculation the mixing of secondary air and fuel is inadequate and reducing burning conditions and CO can be present at 4~5% oxygen at the kiln inlet. Production of clinker in a reducing atmosphere in a cement kiln can seriously degrade the quality of clinker and the cement produced from the clinker. However, an industrial cement kiln is tolerant of reducing conditions without these adverse effects manifesting themselves, provided that the clinker falls into the cooler at a temperature above 1250°C and is cooled in air. Cooling in air from a sufficiently high temperature negates the adverse affects of reductive burning as the clinker reoxidises during cooling. In those conditions a sequence of detrimental affects on clinker quality arise, dependent on the degree of reduction. The reduction of Fe3+ to Fe2+ and the solid solution of Fe2+ in the clinker minerals is the cause of these detrimental affects. The clinker colour changes from grey to brown as Fe2+ replaces Mg2+ in solid solution in C4AF, which reverts to a brown colour. The normal grey colour of clinker arises from solid solution of Mg2+ in C4AF. The Mg2+ distorts the electron cloud of Fe3+ in C4AF resulting in the typical grey colour of clinker and cement. Under more intense reducing conditions the C4AF content is depleted and C3A content increased, less Fe3+ and therefore Fe2O3 is available to form C4AF, meaning that Al2O3 is released to form more C3A. Setting of cement becomes increasingly rapid and uncontrollable due to “flash” setting. C3S is destabilised by solid solution of Fe2+ as FeO and the decomposition to C2S and CaO during cooling is accelerated, subsequent rapid cooling cannot stabilise C3S. The inversion of C2S to the hydraulically inactive γ polymorph is promoted by the incorporation of Fe2+ in C2S as FeO, with attendant dusting of the clinker. However, this catalogue of potentially serious quality problems, colour change from grey to brown, rapid setting due to more C3A and low strength development due to less C3S and hydraulically inactive C2S, can all be avoided, provided that the clinker does not cool to below 1250°C in a reducing atmosphere in the cement kiln and the liquid flux does not crystallise in a reducing atmosphere. We must not confuse this catalogue of potentially serious quality problems with the brown cores which are quite commonly seen within clinker nodules when they are broken. This phenomena is brought about by high temperature reduction of Fe3+ to Fe2+ at the high temperatures in the burning zone. This happens after the C3S has been formed and is therefore not detrimental for strength development of cement (although colour may be affected). All clinker will be reduced to some extent by the high temperatures in the burning zone of a cement kiln. After the clinker passes under the flame the secondary air rising from the cooler re-oxidises the Fe2+ to Fe3+, but large clinker nodules may not be completely re-oxidised through to the core and remain brown in the centre. Porosity, as well as size, is a factor determining the re-oxidation of the cores, low SM clinker may be less porous, due to lower flux content, and therefore more prone to brown cores. Deep knowlage of process Engineering.